Following 10 years of growth for the U.S. Soccer Boys' Development Academy, the Girls' Academy launched on Sept. 2 in Somerset, N.J. as Sky Blue - PDA (Somerset, N.J.) and FC Virginia (Chantilly, Va.) faced off in the Girls' Academy's first feature game. 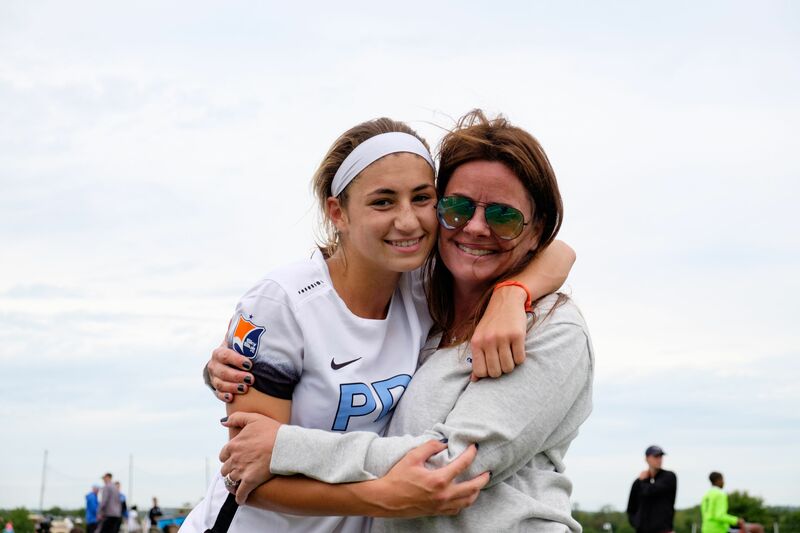 After a decade in the making, the final minutes of pregame pageantry left quite an impression on Sky Blue - PDA parent Ann Chico. "It doesn't compare to anything else. It's like something we've never seen before," Chico said. "The attention that's here on the opening day is just amazing. It was professional, it was emotional, it's a really proud moment for parents too, to see your kids out there at this level." Chico's daughter Nikki captained Sky Blue - PDA on opening day. She read the #TTPledge on behalf of her team, led the starting XI out for introductions and stood on-field for the national anthem. While the build-up on Sept. 2 provided the most eye-catching indication that the Girls' Academy had arrived, the clubs' preparations for the country's new highest level of youth soccer started long before. U.S. Soccer announced its plans for the Girls' Academy in February 2016 and this season's inaugural class of players has been preparing since last season ended. The Academy focuses on training - during the season, teams must train at least four times a week - and 69 member clubs have adopted this philosophy in its first season. "The training was at its highest level on day one," Ann said. "Physically, she (Nikki) has been pushing herself all summer long, on and off the field to get ready for today... She knows that the level of her game has to improve in order to have an impact on the field." Though it was just the team's first game as an Academy club, parents could already see an elevated level of play on the field, noting that the "bar has been raised." The first feature game demonstrated the quality competition that will exist across the nation. "The girls are working very hard together. They seem to be more focused, they're working with each other," said Frank Leskauskas, father of Sky Blue - PDA midfielder Julianne Leskauskas. "The club is behind the DA; they're ready to make this as great as they can." Lauren Justus is used to seeing her daughter play in elite development environments, as Mia has been called-up as a goalkeeper for U.S. Youth National Team squads. With the launch of the Girls' Academy, players will be identified through the U.S. Soccer Scouting Network and have a direct pathway to the National Team program. Several Youth National Team players are taking part in the Academy's inaugural campaign, and Justus thinks that many more from the Academy could be pulled into the player pool in the near future. Over 45 percent of Girls' Academy games have been scouted in the first month, and Academy Showcase events have become a hotbed for National Team, professional and collegiate scouts. "Before, there were scouts around, but now all of the big scouts are here. Now with it live streamed, everyone can see them, everyone can watch these kids," Justus said. "It's attainable now, it's real for them. They're saying 'Wow, we really can go pro or we really can put on a National Team shirt.' There's quite a few National Team kids here; it's wonderful they get to play alongside these kids like, 'Wait, we can do this, we're just as good.'" Not only does the Academy bring together the country's elite youth players, but they're also supported by elite infrastructure in games and trainings. "The refereeing is so much better. Before, the girls, they hurt each other and it's not good for the game," said Leskauskas. "Coaching is going to be excellent. I think it's going to be good for girls' soccer right up to the National Team," added his wife Geryann Leskauskas. Elite coaches are fundamental to the Academy's mission to develop world-class players and all club staff are required to hold at least a U.S. Soccer "B" coaching license. Club directors must hold an "A" license and complete the Academy Directors' course. Referees for Academy games are assigned by U.S. Soccer and crews are specially selected for Showcase and feature events. While the Girls' Academy is still just beginning as it enters its second month, there has been an instant impact on women's youth soccer nationwide. "The level is definitely higher than it ever has been before. The girls know that this matters," Chico said. "We didn't know what to expect, and all the parents on the sidelines were so impressed with the way that it was handled. It makes us proud to be a part of this."